One week from now the 21st edition of Mecal Pro Festival begins. 13 Polish short productions were included in the programme. 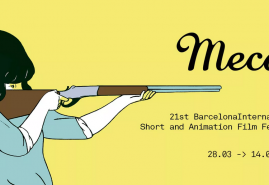 Mecal Pro is an International Short and Animation Festival organised for over 20 year in sunny Barcelona. The event is extremely popular not only in its home country but also abroad - each year the organisers receive over 5 thousand film submissions from around the world. This year's edition begins on 28 March and finishes on 14 April. Eight Polish films were invited to festival's competitions. The following films will compete for the title of the best international documentary: "Their Voices" by Eri Mizutani, "The Briefing:" by Filip Drzewiecki and "The Sisters" by Michał Hytroś. "Squaring the Circle" by Karolina Specht, "You Are Overreacting" by Karina Paciorkowska, "Three Women on a Bench" by Karolina Borgiasz, "Colaholic" by Marcin Podolec and "An Eye for an Eye" directed by Julia Płoch, which will premiere at the Festival, have a chance to become the best animation. The audience in Barcelona will also have a chance to watch two Polish documentaries presented outside of the competition - "Horse Riders" by Anna Gawlita and "In a Lion" by Karol Lindholm - as well as three animations: "Eatself" by Edyta Adamczak, "Thicket" by Adrianna Matwiejczuk and "Incarnation" by Barbara Rupik. More information about the festival is available here. WE KNOW WHO WILL PARTICIPATE IN DOC LAB POLAND! "THE WIND. A DOCUMENTARY THRILLER" IN COMPETITION AT VISIONS DU REEL!